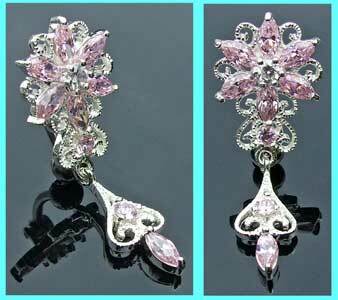 This pretty sterling silver reverse belly bar features a filigree flower and pendant dangle which is set with light pink stones and has a 10mm (3/8") barbell length, and it's worn inserted downwards into the navel piercing. Powered by ShopFactory to sell P9792 online. All-in one eCommerce and online shopping cart software.